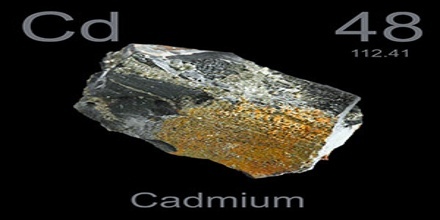 Cadmium is a rare, soft, bluish-white metallic element that occurs mainly in zinc, copper, and lead ores. Its atomic number 48; atomic weight 112.41; melting point 320.9°C; boiling point 765°C; specific gravity 8.65; valence 2. Cadmium and its congeners are not always considered transition metals, in that they do not have partly filled d or f electron shells in the elemental or common oxidation states. The average concentration of cadmium in Earth’s crust is between 0.1 and 0.5 parts per million (ppm). Cadmium was discovered in 1817 simultaneously by Stromeyer and Hermann, both in Germany, as an impurity in zinc carbonate. It occurs as a minor component in most zinc ores and is a byproduct of zinc production. 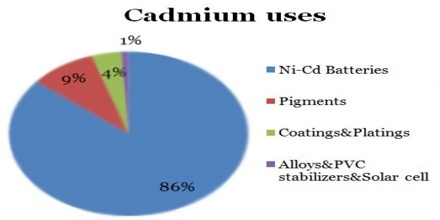 Cadmium is plated onto other metals and alloys to prevent corrosion, and it is used in rechargeable batteries and in nuclear control rods as a neutron absorber. Cadmium is not an element that is used by the body, and it is toxic. It mainly affects kidneys and bones. It is also a carcinogen by inhalation. Cadmium can accumulate in, liver, kidneys and bones, which may serve as sources of exposure later in life. In the environment, cadmium is toxic to plants, animals and micro-organisms. Being a simple chemical element, cadmium is persistent – it cannot be broken down into less toxic substances in the environment. 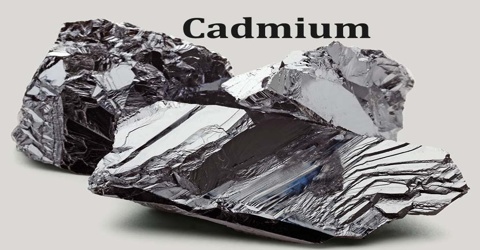 Cadmium is found in nature in mineral forms and is obtained for commercial uses principally from cadmium ore, called greenockite, which is commonly found in association with zinc ore. Commercial production of cadmium ore depends on the mining of zinc. Some zinc ores concentrates from sulfidic zinc ores contain up to 1.4% of cadmium. It is commercially available as an oxide, chloride, or sulfide. Cadmium metal (Cd2+) refined from the ore is a silver-white, blue-tinged lustrous heavy metal solid at room temperature. 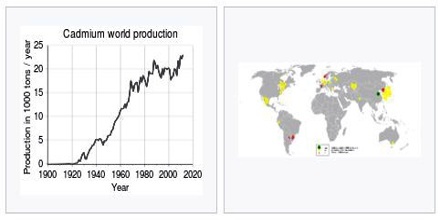 Global cadmium production almost doubled between 1950 and 1990. Since 1990, global consumption has remained constant, at about 20,000 tons per year, although major changes have occurred in its geographical distribution. Production in Asia has increased sharply, whereas the production in Europe has decreased. Major shifts and improvements in smelting and refining technologies have led to significant decreases in releases of cadmium to the environment. Recycling accounts for 18 percent of the cadmium production worldwide. Cadmium was often used to electroplate steel and protect it from corrosion. It is still used today to protect critical components of aeroplanes and oil platforms. Other past uses of cadmium included phosphors in cathode ray tube colour TV sets, and yellow, orange and red pigments. Cadmium is a poison and is known to cause birth defects and cancer. As a result, there are moves to limit its use. 80% of cadmium currently produced is used in rechargeable nickel-cadmium batteries. However, they are gradually being phased out and replaced with nickel metal hydride batteries. Cadmium is used in the control rods of nuclear reactors, acting as a very effective “neutron poison” to control neutron flux in nuclear fission. The pressurized water reactor designed by Westinghouse Electric Company uses an alloy consisting of 80% silver, 15% indium, and 5% cadmium. It is a component of some compound semiconductors, such as cadmium sulfide, cadmium selenide, and cadmium telluride, used for light detection and solar cells. HgCdTe is sensitive to infrared light and can be used as an infrared detector, motion detector, or switch in remote control devices. Reference: greenfacts.org, rsc.org, dictionary.com, atsdr.cdc.gov, wikipedia.